23 Dec Christmas at Our Church: Shippensburg, Pa.
Christmas time is always a busy time at Prince Street, from decorating the sanctuary to our Christmas Eve services on December 24. We do Angel Tree Ministry, which helps the children who have parents who are serving prison sentences and cannot be home with their families at Christmas time. It is an excellent opportunity to share the Christmas story with the children and present the children with a gift that is from their parent. It is wonderful to see a child’s face who realizes that their dad or mom remembered them on this special holiday. This year our mission commission decided to help our local families. We have community meals every month reaching out to people who are lonely and need an encouraging word and support. During Christmas, one of our meals is a Christmas dinner with turkey, stuffing, mashed potatoes, cranberry sauce, and corn. We also purchased gifts for the children. Christmas Caroling is always an exciting time. We divide into groups and go caroling to our people who are home-bound or residing in nursing homes. Our choir presented us with a beautiful musical program on the real meaning of Christmas, and we even had a cookie contest where we had an opportunity to eat and fellowship with one another. Children from Atlantic Avenue UB with shoeboxes for Samaritan’s Purse. Loading shoeboxes at Atlantic Avenue. Atlantic Avenue UB church (Franklin, Pa.) participated in Operation Christmas Child. They collected and sent 130 shoeboxes to Samaritan’s Purse. Sunfield UB church (Sunfield, Mich.) is taking a team to Jamaica in March to work on the roof at the Yorktown UB church. They need three more people to be part of the team. Cost: $500 plus airfare (per person). Books 2 and 4 of the “Grow in His Word” materials are now available. The Grow In His Word materials, used in discipleship by over 50 United Brethren churches, have been completely revised. Grow is written by Dennis Miller, pastor of Emmanuel UB church in Fort Wayne, Ind. Grow is used in over 50 United Brethren churches, and over the years has been used to systematically take thousands of people through the entire Bible. There are four books, each of which has its own leader’s guide and accompanying teaching slides. The Grow Ministries plan is a 52-week study which takes students through the Old and New Testaments in an orderly manner. Students grasp not only what happened, but in what order, with hooks and memory tools to help them remember what they learn. As believers learn about God’s Word, they gain confidence in their understanding and use of the Bible. A student book, leader’s guide, PowerPoint and Keynote files, and audio files are all available. I am very grateful to the Lord for what he has been doing through you and your team for Sierra Leone since the Ebola crisis began. To be very honest with you, sometimes I become very shy and find it difficult to continuously make appeals for Sierra Leone. But I am also compelled because things are becoming more difficult by the day. We are suffering as a nation from isolation, quarantine, stigma, threats, hunger, etc., all because of this dreadful disease. Some of our members have lost their jobs because their institutions have closed down. We have been doing our best to make sure that the hospital and staff at Mattru are secured. Justin Marva and I were there on Tuesday [Dec. 2] to investigate a case at the hospital when we had the first Ebola case. The patient traveled from Gbangbatoke to Moriba Town in Rutile, to Mokabba, and to Luawa Jong. From Luawa she was admitted at the hospital before she passed away on Tuesday. After her result proved positive on Thursday [Dec. 4], part of the hospital and some staff members were quarantined–some at the hospital and others at their homes. The total number of staff quarantined is 14. Five are at the hospital quarters and the rest are at their homes quarantined with their families. This has worried us so much because there is not much food and other supplies from the government for quarantined homes. Individuals and organizations out here fight it out very hard to get food and other items to their families and staff. This is what we want to do for the staff and the villages involved. Apart from the hospital staff, two of our pastors and their families are quarantined also because they had connection and contact with the deceased. They are Rev. J. S. Savalie and Rev. W. O. Solomon. I appreciate your immediate response to this call…. What you have sent is just for an emergency responce to Mattru hospital. We are also thinking of helping the churches in Kenema and Moyamba which are still quarantined and isolated. I have also been making appeals for our brethren in Liberia, because since they appealed to us for help, we have not reached them with anything. We appreciate all what God is doing through you and our donors in North America and Canada. Our Mattru Hospital in Sierra Leone has had its first Ebola death. Jeff Bleijerveld, Director of Global Ministries, learned of the situation through an email with Bishop John Pessima and a phone conversation with Dr. Richard Toupin. The patient came from a village two miles away. It’s not known how that person contracted Ebola, and that is a matter of high concern. The village is now under quarantine. Also under quarantine are 13 staff at Mattru Hospital. They include one doctor and nine nurses; the rest are administrative or support staff. One of those nurses is the wife of Rev. Bondo, who pastors the Fleming Memorial United Brethren church next to the hospital. The Bonthe District, where the hospital is located, has been kept largely free from Ebola. Bishop Pessima will be notifying Jeff Bleijerveld of the hospital’s needs, which will include relief supplies for the persons being quarantined. Jeff says that, thanks to generous donations already made, Global Ministries will be able to respond immediately. Today, December 8, we are sending $1000 to help with the situation. 02 Dec Got Any Used Baseball Equipment for Nicaraguans? Members of the Huntington University baseball team are getting ready to spend part of January in Nicaragua, where they will conduct baseball clinics and play against local teams. This will be the third such trip; the others occurred in 2012 and 2014. Two UB ministers will take part once again: Josh Kesler, pastor of The Well (Huntington, Ind. ), and Jeff Dice, associate pastor of Brown Corners UB church (Clare, Mich.). Do you have any used baseball equipment they could take with them? They’ll use it in the clinics with Nicaraguan kids. If so, contact Jeff Dice by email. Global Ministries recently launched its own Facebook page. We post late-breaking news and other information there. Already, over 300 people “Like” our page. Go here. Are you receiving the Global Ministries Prayer Guide? This monthly email provides regular updates on how to pray for our world, international partners, Global Ministries staff, and short-term volunteers. Currently, about 175 people receive it. Subscribe here. 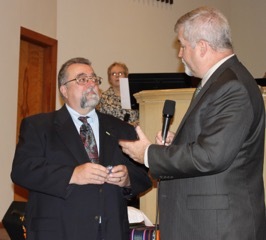 Bishop Phil Whipple (right) presenting a retirement pin to Mike Arnold. On Sunday, November 30, Bishop Phil Whipple presented a retirement pin to Rev. Mike Arnold. It was his last Sunday as pastor of Crossroads UB church in Charlotte, Mich., the church Arnold has pastored since 1999. Arnold come out of what is now New Hope Community UB church in Bryan, Ohio. He began pastoring in the United Brethren church in 1984, serving four years at the Sherwood-Delaware circuit and then five years at West Windsor UB church in Dimondale, Mich. In 1993, he started a UB church in DeWitt, Mich., serving there until 1999. Arnold graduated from Huntington University in 1986 with a degree in Bible & Religion, and received the Master of Christian Ministry from HU in 1990. He was ordained in 1990. Every year, Global Ministries sponsors trips to our international conferences. Here are the ones currently scheduled for 2015. January 3-10. Construction trip to Malvern Camp in Jamaica. Cost: $750 per person plus airfare. Team leader: Dwight Kuntz. February 7–14. Construction trip to Jamaica to work on the new dining hall at Regent College of the Caribbean. Cost: $750 plus airfare. Team leader: Dwight Kuntz. March 7–14. Ministry trip to Guatemala to work with Global Ministries partnering agency CH Global. Cost: $750 plus airfare. June 19–27. Medical mission trip to Honduras. Team leaders: Robert and Fonda Cassidy. Cost: $750 per person plus airfare. June 26—July 8. English camp for teens in Poland. Cost: $750 per person plus airfare. The team will work with missionaries Donna and Arek Delik, church planters in Kutno. July 25—August 1. Construction team to work at the new conference center in Masaya, Nicaragua. Cost: $750 plus airfare. October 10-17. Construction trip to Jamaica to work on the new dining hall at Regent College of the Caribbean. Cost: $750 plus airfare. Team leader: Dwight Kuntz. November 11-21. Ministry/vision trip to Macau. Cost: $2500 per person. More information will be presented at the UB National Conference in Michigan in July 2015.